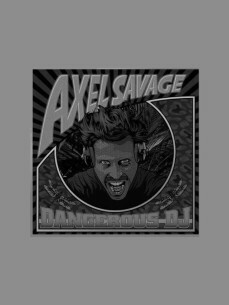 Coming from the south of France, the land of free party, Axel Savage has been practicing the secret art of Djing for over 10 years before moving to Amstedam. This is where he met the Jungle guru DJ Chaos from the Melkweg. Together they started the «BAMBAM» nights in club SugarFactory and now in OT301 and Melkweg. Inviting some international artists such as Congo Natty, Benny Page, Radikal Guru, Vibration lab or Mc Xander. At the same time he was organizing the « Atmosphere» nights in club Korsakoff and now in OT301. Exploring the deep minimal Dubstep vibrations. First inspired by the dark side of Techno he recently moved into a more conscious sound with mixing more and more lyrics in his sets. Now very influenced by the sound system scene such as : King Shilloh, Black Board Jungle, King Earthquake or Irration Steppas; he is playing 100% vinlys sets. Mixing the power of electronic music with the positive energy of Ragga-Dancehall to shake your body. Be prepared for a strong musical experience : A perfect mix of broken rhytms and groovy basslines with inspired lyrics.